Kindas Has The Sponge Bob Combo! 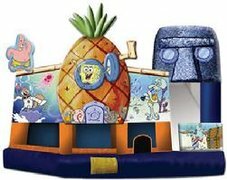 Description: Kids and students can visit their favorite pineapple under the sea with this licensed SpongeBob Square Pants 3D 5-in-1 combo-style bounce house. Hours of entertainment are to be had with Sponge Bob and his sidekick, Patrick in the warm waters of Bikini Bottom. Experience more than 250 feet of real 3D imagery with SpongeBob's pineapple house and plenty of frolicking SpongeBob panels—sure to attract eager participants and spectators!